"The Bible does not teach that the sinner must repent before heeding the invitation of Christ. We can no more repent without the Spirit of Christ to awaken the conscience than we can be pardoned without Christ... [He] is the source of every right impulse. Every desire for truth and purity, every conviction of our own sinfulness, is an evidence that His Spirit is moving upon our hearts." We thank Kristina Kozakova, a recent WWU graduate, who shares her singing with us and Bruce Toews, a WWU professor in the School of Business, who leads the band. Kristina sings a famous and much loved song by the great French composer Charles Gounod (1818–1893). As you prepare to worship please silently contemplate the words of our opening hymn or those of the anthem, some of which are given here. Thank you for your generosity to the local ministry of the University Church, as well as to the global mission of the Adventist Church. Today, the loose offering goes toward the University Church budget. Aside from pastors' salaries, which are funded by donations marked "tithe," the University Church budget funds all local ministries including Youth and Children, WWVA and Rogers subsidies, broadcast, worship, and the upkeep of our facility. Give online by clicking here or the "give" button. 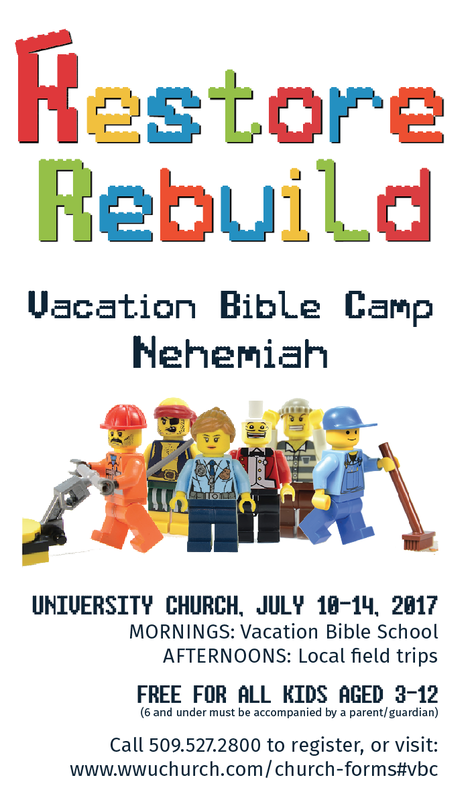 Register now for Vacation Bible Camp at the University Church. July 10–14, VBC will feature daily morning Bible programs followed by afternoon field trips. Register in the children’s wing on Sabbath mornings, by calling the church office at 509.527.2800 or by registering online here. Youth Event, Sabbath July 1, 5-7pm at Rooks Park. Join us for worship and games! The WWU Freshman Mentoring Program is looking for people who have a passion to help college students succeed. If you are interested, call KarrLayn Beck at 527-2715 or go to the WWU website, under staff employment. Small group Bible Study, Prayer, Praise, and Promises. Every Tuesday at 6:30pm at Heubach Chapel. Come to share and pray together. All Welcome. A memorial service for Wayne DeMoss, husband of Dorothy DeMoss, and grandfather of Pastor Kris Loewen, is planned for Sunday, July 16, at 11am in Heubach Chapel. Bracelets supporting Miles Kearbey are available. They are $5 each, available in both adult and youth size, 100% proceeds go to the Kearbey family. They’re orange (the color for pediatric cancer) with the following inscription: #MilesCourage *Psalms 27:14* #MilesStrength If anyone is interested in buying one (or more), they are welcome to email, text, or call Kate Follett, kate.follett@gmail.com, (509)876-9131. A mini-bazaar fundraiser supporting Julianna Sayler in her fight against DIPG will be held on Sunday, July 2, from 11:00 a.m. to 4:00 p.m. All 12+ vendors involved will be donating a portion of their sales to Julianna. The bazaar will be held at the corner of Wallula and Campbell, just outside College Place. Contact Carrie Bergherm at carriebergherm@yahoo.com for more information. WWU is Hiring! Please visit jobs.wallawalla.edu to view available positions and to fill out an online application. An overnight prayer meeting for the projected closure of WWGH is planned for July 8, 10:00 pm until daylight on July 9, at WWGH. This will be an open meeting, focusingon the providers, employees and their families and all who have been served by them in the Walla Walla Valley. Questions? Contact Pat Williams, 509-522-2546. Volunteer Teaching Position in Dillingham, Alaska for 18 years or older. If you have at least one year education training, Dillingham Adventist School might be the place for you next school year. Call or text Sueal Cunningham at907-843-2177 for more information. Gigantic Closing Sale of the Countryside Store, located in the basement apartment of the Hawkins Home at 374 SE Highland Park Dr. in College Place. They are selling all inventory, new books $1 each, used books $.10 each. Garage sale Tuesdays and Thursdays from 1-3pm until the end of 2017. Call 509-526-4024 with any questions. Camp MiVoden: The Great Adventure Your happiness, this summer, is on the mind of all the staff gearing up for a wonderful summer. Visit mivoden.com and register today or call 509-242-0506. Check out the “Ultimate Camps” online such as challenge, cowboy, extreme, wakeboarding and white water rafting. And the regular camps may have space for you still. Look at the possibility of adventure, junior, tween, teen or the family camps. 11am-4pm — Bazaar Fundraiser for Julianna Sayler, Wallula and Campbell Rds.